When Gary Gygax and Dave Arneson first formulated the rules for Dungeons & Dragons, one of their influences was the works of pulp writer Robert E Howard, specifically his Conan stories. Since then there have been several RPG versions of Howard’s world, the Hyborian Age, and this is the latest iteration published by Modiphius Entertainment. It is available as a free download from Modiphius’ website. You get some fifty pages comprising an introductory chapter, an overview of the Hyborian Age, a rundown of the basic rules for the 2D20 system that the game uses, a fourteen page adventure featuring a number of linked scenes and stat sheets for seven pre-generated characters. The 2D20 system is well established in Modiphius’ roleplaying games and these Quickstart Rules includes a summary of the basic rules over nineteen pages. Skill tests are crucial so it is important for a party to have a good spread of skills between them. Good dice rolls gain players Momentum, which can be used to carry out a task faster or more effectively or stored to be used on subsequent actions taken in the same turn. Opposing this, the Games Master has Doom points which can be used to assist non-player characters, trigger special abilities or events and generally make the players’ lives that bit more complicated. There are no rules included for character creation. However, the pre-generated characters cover a variety of character types and give a good flavour of the game eg ‘curious noble’, ‘experienced tracker’ and ‘brave herder’. The Quickstart adventure included is called “To Race the Thunder” inspired by events that occur in Howard’s short story “Beyond the Black River” wherein Conan battles numerous Pict war bands in the area of Westermarck, a borderland to the west of Aquilonia, set between the Black and Thunder Rivers. If the aim is to capture the flavour of Howard’s world, then it succeeds admirably. It also provides a good workout of the 2D20 rules for the GM and players alike. There will be plenty of fighting and quite likely player deaths. The interlinking scenes that make up the adventure provide a variety of challenges for the characters and should keep them entertained until the end. Exploring the website, this is clearly an exciting project with plenty of supplements, detailed sourcebooks and accessories planned. Great play is made of the top drawer artists and illustrators lined up to contribute to these books. As it happens I felt the Quickstart Rules would have benefitted from a few more illustrations, especially sketches of the pre-generated characters. 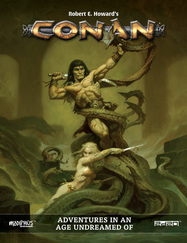 Overall this is a first class package and well worth a look for any fans of Conan, the Hyborian Age or the 2D20 system. I fear that “Robert E Howard’s Conan: Adventures in an Age Undreamed Of” does not trip of the tongue, though, and would have preferred a simpler title.